Measure your dog using our directions below; then use the sizing chart to determine which size is right for you and your pet. Note: We recommend these sizes based on our experience. Crates are standardly sized so that your dog can comfortably walk in, turn around, and lay down. Also consider your dog’s habits and environment: For instance, do they like to sleep curled up or stretched out? Is your climate warm or cool? If you have a puppy, go with the measurements of a full sized breed. And don’t forget to check the exterior dimensions to ensure the unit will fit in your home. 1) MEASURE your pet’s height while standing. 2) COMPARE your dog’s measurements to the sizing chart below. 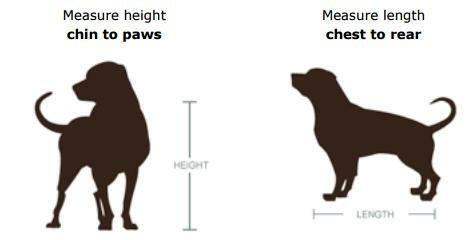 Using your dog's height and length , compare it to the sizing chart (see below) to determine which size is right for you. Your dog needs to be able to walk in, turn around and lay down in his Den. Also, think about where the your Den will be placed in your home and the size of your furniture. We recommend these sizes based on our experience. Beware if you buy a size too small, your dog may feel cramped. After you measure your dog, use this chart to determine the size Townhaus you need. The interior dimensions are the actual inside measurements of the Townhaus.